Sunday, February 19: My sister-in-law Suzanne (who spends half her life in Paris) has her French goddaughter Mathilde staying with her at the moment. They came to dinner this evening with Guy, Deborah and me. I decided to introduce her to Canadian wine. We started with Henry of Pelham Rosé Brut and then moved to Flat Rock Pinot Noir Reserve 2009 with barbecue steak, Quails’ Gate Merlot 2008 with the cheese and Tinhorn Creek Kerner Icewine 2009 with crème brûlée. Mathilde, who is 23, was duly impressed. Monday, February 20: Family Day. Spent the day with Deborah and Pinot the Wonder Dog. In the evening Deborah and I went down to the Drake Hotel for the launch of a new, hip food and wine internet site, Swallow. Then Deborah, Cynthia David and I tried to find a place to eat. Dropped by Gand Electric but they said no table for 90 minutes. Tried a couple of other places and finally ended up at Wurst on King West. Didn’t realise it was only sausages – I thought they were trying to deflect criticism by their name. Shared three different sausages with French fries (and “Dirty Fries” – a kind of vegetarian poutine as far as I could make out) and a Quebec beer. Tuesday, February 21: A make-up tasting at Vintages for a session I missed when I was in California. Zoltan Szabo returning from Peru came straight from the airport to help me out. I picked up Deborah from Restoration Hardware at 5 pm and we drove down to overnight at the Sheraton on the Falls for a “Friends & Family” soft opening of Windows by Jamie Kennedy. We could choose what we wanted from the small plates menu. 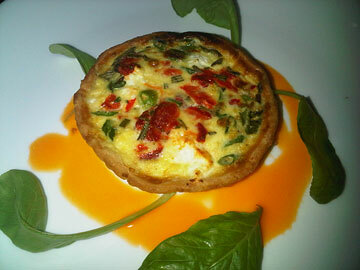 I ordered vegetarian tartlet with peppers and goat cheese (melts in the mouth) with a glass of Elena Walsh Pinot Grigio 2010. Deborah: Root vegetable salad with a glass of Magnotta Special Reserve Semillon. Me: Pork and beans. Deborah: Duck leg crepe with Upper Canada comfort cream and Niagara cherry pastrique. Then we shared a chicken pot pie. Dessert: Pouding chomeur and tarte tatin. Wednesday, February 22: Deborah dropped me off at First Canadian Place for a tasting of the top scoring wine from each winery that will be participating in Cuvée next month. Shopped at Vintages for the wines I’ve selected for a tasting arranged by my son Guy for his friends on Friday. For dinner, baked salmon with Cedar Creek Platinum Chardonnay 2009 (straw colour with a spicy, tropical fruit nose with citrus notes; medium-bodied, elegant and well balanced with a lovely mouth feel. (90)). Thursday, February 23: To Costco to pick up supplies for Friday’s tasting – beer cups for spittoons, bottled water, napkins, etc. Then down to the Fermentation Cellar in the Distillery District for a portfolio tasting of wines imported by Treasury Wine Estates. 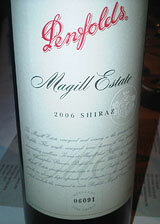 Began with a series of eleven Australian Shiraz, the highlights of which were Saltram Marme Brook Shiraz 2008 (90) and Penfolds Magill Estate Shiraz 2006 (92). I didn’t get around to everything on offer – there were 76 wines available – but the other great-tasting wines were Etude Chardonnay 2009 (90), Etude Cabernet Sauvignon 2007 (91), St. Clement Cabernet Sauvignon 2007 (91), and Beringer Private Reserve Cabernet Sauvignon 2006 (91). But the wine of the day was Beringer Private Reserve Cabernet Sauvignon 1990 – smooth as silk, tasting like a majestic claret (93). For dinner, pork loin with Babich Sauvignon Blanc 2011 (this wine has some residual sweetness that worked well with the pork). Saturday, February 25: Tasted some new wines from Niagara College Teaching Winery.